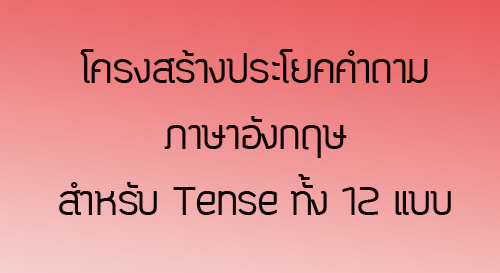 - Present Simple คือ Do ,Does + S + V1 ? 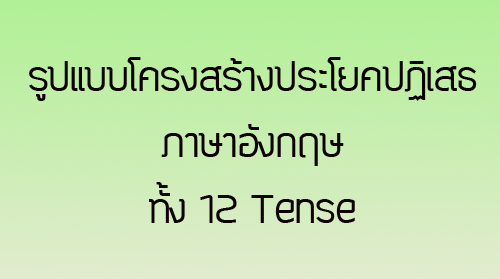 - Present Continuous คือ Is , Am , Are + S + V1 + ing ? - Present Perfect คือ Have , Has + S + V3 ? - Present Perfect Continuous คือ Have , Has + S + been + V1 + ing ? - Past Simple คือ Did+S+V1 ? - Past Continuous คือ Was, Were + S + V1 + ing ? - Past Perfect คือ Had + S + V3 ? - Past Perfect Continuous คือ Had+ S + been + V1 + ing ? - Future Simple คือ Will , Shall + S + V1 ? และ Is , Am , Are + S + going to + V1 ? - Future Continuous คือ Will , Shall + S + be + V1 + ing ?